Ah, the art of the sales presentation. THIS is what you are all about, what you do. And who you are. Let's talk about how to show your stuff! Tell them a story that you created just for them. Charm them. Surprise them. Show them the power of your passion. Passion is contagious. If you want to sell more home furnishings and exceed the expectations of your clients, you need many attributes. Perhaps the most important of these is passion. Passion for who you are and for what you do. Don't shake your head in disbelief. This is not New Age armchair philosophy. No, this is you now! You are a Professional with a Purpose who is going to make something happen at each Presentation you give. You Present yourself to your clients on a minute-by-minute basis. How does the Presentation of You look? How are You doing? How much Passion are you Perpetrating? I always said that the “Presentation is everything” and I was so wrong. Presentation isn't everything, it's the only thing! This rule applies to Presenting to customers who just walked in the store. They told you what they want, and why they stopped in. It also applies when you are Preparing a more elaborate Presentation as a result of a home visit. By bringing their rooms to life, you are helping them, as the Professional, own what they want, need, and love in their home. their Project becomes your Project. Be careful when making a presentation to give them what they want. This may not be anything like what you want, need or even like. Presenting… it really is about “ETHEL. When you put together all these ingredients, plus you add your spark of Passion, well then, you have the formula for success! Let's start dissecting the presentation process by looking at some Primary Principles. First, remember to ask yourself, who is this person? Why are they here? What do they want? Once your ears are tuned in, if you are interested in listening at a higher level, two other body parts should become involved. Another body part to watch is… well… all of it! Watch how they move and the way they gesture. What are they looking at, and what makes them smile, or not! These non-verbal signals that can tell you what they're really thinking. Watch your body language. Are you leaning forward as they're speaking? Are you showing curiosity? Are you interested in what they're telling you? Are you “getting” what they want? It is much better to be interest-ED than interest-ING! Josh Gordon, who wrote, “Selling 2.0,”says that sales consultants “should engage in deep listening. Deep listening for buying signals is all about seeing and understanding beyond the obvious. Go beyond the superficial to the next level. 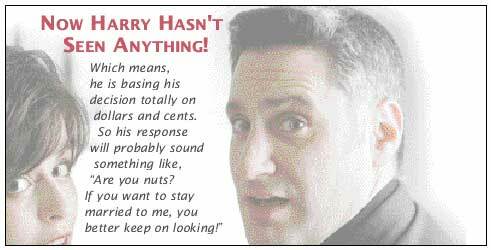 ”He also points out, “Listening for buying signals is really easy to do badly and really hard to do well.” Remember that nobody ever listened themselves out of a sale! Okay, now that we have all body parts engaged, let's go on to . . . PREPARING the Presentation. You will be Preparing “Ethel”…That's right. “Ethel!” There can be no surprises at this stage, so let's get her ready first. RULE #2: Both decision makers will attend the presentation. This rule is not optional. She and Harry will both need to be present at the presentation. If she tells you that, “Harry doesn't need to be present. I make all the buying decisions. He doesn't care what I do.” Be skeptical. It is my experience that the people who say this are lying or dreaming. 1) Harry will come in to see it the next day. This will mean that you have to do your presentation again. It's harder the second time. You have to ratchet up enthusiasm, and surprise when “Ethel” has already seen it. One of the greatest commodities your company, “Me, Inc.” has, is time. Unless your company is a non-profit, you probably don't have time to do this again. Ask yourself, can she present them the way you can? Can she justify WHY, and WHAT was selected? I think not. Your business is now in her control. Scary, isn't it! 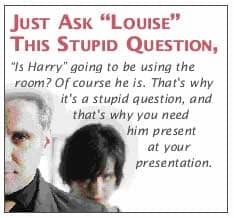 Just ask “Louise” the most stupid question, “Is Harry” going to be using the room? Of course he is. That's why it's a stupid question, and that's why you need him present at your presentation. He needs to be involved. If “Louise” ends up running back and forth with fabrics and prices the whole process gets out of your control. It ends up taking too long and becomes too hard. You want to make the buying process easy for your customer. When the buying process gets out of control, it becomes too easy for both you and your customers to lose out! Don't get me wrong, every now and then there will be times when both decision makers are not required. But it is the exception - not - the rule. Don't play those odds. Don't run your company like a roulette table in Vegas! It's your time, your money, your company. You are not on a mission to crack the DaVinci Code! Make the sales process fun! You are on a mission to help “Harry” & “Louise” have a beautiful home. Have a second group to show them, but only as a back-up. Only show the alternate, if (big IF) they don't like the first selection (and why wouldn't they? You selected it “based on what they told you” so why wouldn't they like it? Giving too many options makes you look bad, and unprofessional. It's as if you don't know what you are doing. You may seem that you aren't really sure which ones they will like, so you show them a “variety.” Some consultants also like this approach because they want to be “nice” and show them everything. Well... STOP IT! Step Three: "Hey Look Me Over!" If your “Production” is part of a formal Presentation… do not only dress for success... dress for “Ethel” and “Ralph.” Make sure your wardrobe selection is painting the same color palette as the masterpiece of paints that you are brushing across the canvas of “Ethel” and “Ralph's” home. You got it. Coordinate your outfit to blend with the fabrics you're presenting. It also says that you cared enough about them that you took the time, and made the effort to do this for them. Note: If you don't own “said garment,” then go beige or black so that you don't distract from the beautiful look that you did create. Step Four: How Do You Get To Carnegie Hall? You all know the answer to this one. It’s Practice, Practice, Practice! As Mr. Hoff points out, “Talk to yourself before you talk to them.” Practice your performance. Analyze WHAT you will be saying. HOW you will be saying it. To WHOM you will be saying it. Your presentation must be focused on the personalities of the ATTENDEES. TIME is his enemy. He doesn't need or want to hear any romance words. Know your A, B, C's: Keep your presentation Abridged, Brief, Concise. Give him/her the facts about the product. Point out that it's an excellent INVESTMENT. Ask him to AUTHORIZE the paper work. Mission accomplished. Write it up. He's out of there and onto his next conquest. She's here to be entertained and have a good time! If you're ever going to romance, and paint a picture about what she is going to own, do it during the presentation. Bring her project to life. She wants to be REASSURED. Hold her hand. He's buying for three reasons: Logic, Accuracy and Value. You can “Spray and Pray” with this member of your audience. He wants to know everything you've ever heard, seen, read, or dreamt about construction. Don't get “flowery. Stick to the facts. Don't chit chat. He'll get bored. You'll lose him. Let him know, “This is the most LOGICAL decision for you. It will give you the results that you want to achieve,” THAT is what he wants to hear. The Presentation. It's so easy, and so hard. That's why it's an art and a skill that must be learned and constantly fine tuned. It's your stage. Your arena. Let your passion shine in the spotlight. You are the pro. This is what you do. This is who you are! It's Showtime!